The conservation management plan for the Chandigarh Museum and Art Gallery will be a holistic approach. It will focus on the iconic modern building designed by architect Le Corbusier around 1962 which houses invaluable collections. 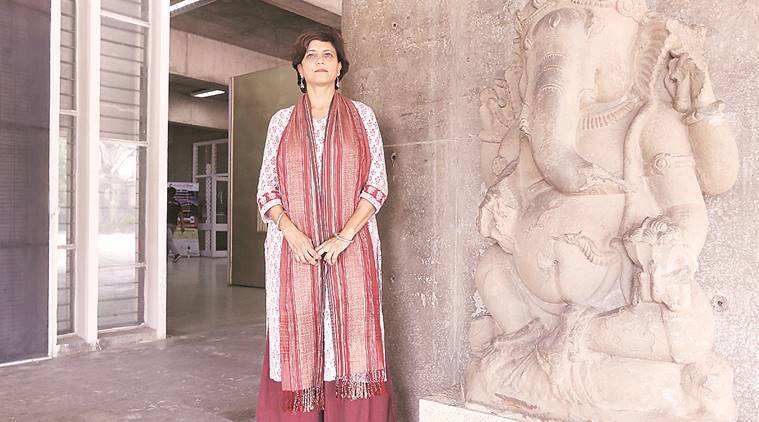 Conservation architect Shikha Jain, Director, Preservation and Community Design, DRONAH, shares the conservation management plans for the Gandhi Bhawan and Chandigarh Museum with Parul. Please share the philosophy and intent behind the Getty Foundation grant of $150,000 (2017) to the Government Museum and Art Gallery, Chandigarh, one of the 12 significant 20th century buildings to receive the grant under the ‘Keeping it Modern’ initiative. The Getty Foundation Programme ‘Keeping It Modern’, is a grant initiative focused on supporting model projects for the conservation of modern architecture. The Government Museum and Art Gallery in Chandigarh is a pivotal work by Le Corbusier, representing the culmination of the concept he developed with Pierre Jeanneret. Their 1931 idea for a “Museum of Unlimited Growth” employed the design principle of a nautilus, radiating outwards from the centre to create a sense of unrestricted expansion. The Chandigarh Administration has cared for the building well over the years, but Punjab’s extreme climate has caused material failure of exterior and interior walls. To break the cycle of adhoc repairs, the Museum will develop a research-based conservation management plan. The plan will provide a detailed overview of the building’s condition with recommendations on the most urgent conservation repairs and a strategy with schedules for regular maintenance. To enhance the impact of the project, the team will strengthen local capacity through workshops and museum training and build international connections by convening representatives from the other two similar museums in Ahmedabad and Tokyo. The grant aims to support the conservation, planning and research of the modern 20th century heritage, the purpose being that these will provide models for the protection of modern architecture. How is this going to be done? The conservation management plan for the Chandigarh Museum and Art Gallery will be a holistic approach. It will focus on the iconic modern building designed by architect Le Corbusier around 1962 which houses invaluable collections. The building will be studied and analysed within its contextual and climatic setting to arrive at a conservation planning model that encourages conservation of the building materials, its internal environment and exterior landscape including aspects of passive control and preventive conservation. The project goals are to arrive at a Comprehensive Conservation Management Plan comprising guidelines for preservation of building and landscape, long-term maintenance and appropriate use of the Museum’s spaces and display strategies, keeping in mind the significance of the building, its collection and their association. What are the changes or conservation measures that you foresee for the Government Museum and what is going to be the impact? For the Government Museum, at present, we have carried out comprehensive condition assessment of the building structure and materials. We are still working on the history of interventions and also historic research on the conceptualisation of the museum by Corbusier, implementation by eminent architects such as SD Sharma, besides the vision of MS Randhawa and inputs of interior designer Ratna Fabric at that time. So, besides looking at several archival documents, oral history recordings of experts like SD Sharma and BN Goswamy, who are familiar with the history of the Museum, changes made since its inception is very important for our understanding. These findings will finally culminate into tangible proposals for bringing back the original form and interiors of the Museum as it was meant to be. Please tell us about the role and contribution of Development and Research Organisation for Nature, Arts, and Heritage (DRONAH) in this initiative. DRONAH is working as the technical arm for this project for Punjab Engineering College (PEC), which is the overall institution for implementing the grant work in coordination with the Museum and other sub-agencies. We are responsible for the entire process of documentation, surveys, analysis, architectural and conservation planning drawings for the project. We have a team of experts including landscape architect, lighting and services expert, risks management expert Dr Rohit Jigyasu and conservation architects involved in preparing this conservation management plan. Also, is Gandhi Bhawan included in the buildings for this grant, as you shared in your presentation? Gandhi Bhawan was the first building in India to receive the KIM Getty Grant in 2015. The process of preparing the Conservation Management Plan for it was completed in early 2017 and highly appreciated by the Getty Foundation. This ‘Concrete Lotus’, as they term it, is being showcased on their website. Now Panjab University is in the process of implementing the conservation management plan for Gandhi Bhawan. What are the various steps for preservation and protection that you have taken in the Gandhi Bhawan project. What are the visible improvements? In Gandhi Bhawan, the biggest challenge was to replicate the grit wash panels on exterior that are on various stages of deterioration. The material analysis, com-positional analysis and deciphering fixing details for that led to finally preparing mocks-ups to match the exteriors. Another challenge that remains is the retention of the pool water and to bring it back to its original glory. These may take some time but minor visible improvements have been made in the interiors with lighting fixtures back to original, original furniture has also been brought back in the building, signages and an interpretation room displaying the original model with some panels about position and conservation planning of Gandhi Bhawan. What are the challenges in this process of planning for conservation and how important and vital is the preservation of our heritage buildings. The biggest challenge is accepting planning as a process in the Indian scenario. Usually, we are so eager to see results on site and do not have the patience to go through research and planning, which is very essential for any conservation work. Conservation is very different from architectural design. In architecture, we are given a clean site, blank canvas where the architect- designer can imagine and create a new design as per his/her understanding of the site context. But in conservation, you already have a painted canvas or an existing building, so a conservation architect has to first understand the mind and concept of the architect who built the historic structure and also note all changes carried out in the building by various users through time. Then an understanding of the heritage value of each space and material that needs to be retained. It is only after a complete understanding of the past history of the building that the conservation architects can propose conservation works and any new intervention. In that sense, a conservation architect at times needs to curb creativity or extend her creativity beyond the limits to propose the right solution for the existing building. Preservation of our heritage is extremely vital to retain the cultural identity of our cities and for future generations to remain connected to their roots. Apart from the technical measures, you talked about documenting techniques like oral history, workshops, studying drawings and other inter-disciplinary activities. Please share the intent. All these sections of the Conservation Management Plan will address specific issues and enhance the overall cultural significance of the site and its collection. These will also serve as important resources for future reference as well as for future fundraising for the building as well as other structures within the site. How will the citizens and art lovers from across the world benefit from these projects? The meaning and value of this heritage will be communicated to the visitors and art lovers through such projects. So they serve as not only examples to preserve heritage, but also to communicate the significance of these in present day life of people. This project is intended to go beyond preparation of a conservation management plan and serve as a pilot case for modernist architecture and museums in India promoting aspects of climate control and preventive conservation. Any other projects in the region that your organization is currently involved with? In the region, DRONAH has worked on several projects for the Government of Punjab, and our most revered project in this region is the conservation of the Main Shrine, Golden Temple and restoration of the paintings at Darshini Deodhi.